Home Oral Health & Hygiene Can Chlorine in Swimming Pools Dissolve or Stain Your Teeth? Can Chlorine in Swimming Pools Dissolve or Stain Your Teeth? Is it possible that spending a lot of time in the swimming pool can stain your teeth or even slowly dissolve your teeth? 1 – Can swimming pools stain my teeth? 2 – Can swimming pools dissolve my teeth? Let’s get started with the first question. Can Swimming Pools Stain Your Teeth? Apparently a few of his swim team patients over the years have experienced discoloration. It’s not permanent (he was able to scrap her’s off). He didn’t explain the chemical reaction taking place. According to eHow, the optimum pH level in a pool is 7.2 to 7.6. This pH is considered to be basic. In general, solids dissolve in acid and then precipitate (or become solids again) in bases. This means that in a basic swimming pool, the calcium and minerals present in your mouth will harden onto your teeth rather than dissolve (as they would if the pH were acidic – this is why your teeth dissolve slowly when you eat or drink anything acidic.) The higher pH of the swimming pool, in combination with the antimicrobial compounds that the pool water contains, causes proteins in your mouth to break down and get together with minerals in your mouth to form a hard, yellowish-brown mineral deposit on your teeth. To answer the question, swimming a lot can cause you to get yellow to dark brown stains on your teeth that your dentist or dental hygienist should be able to remove for you at a routine cleaning appointment. Can Swimming Pools Dissolve Your Teeth? As I mentioned above, the optimal pH level in a pool is 7.2 to 7.6. If you read my article about drinks that can dissolve your teeth, you might remember that teeth start dissolving at a pH below 5.5. So… could a swimming pool really dissolve your teeth if it is kept at the optimal pH of around 7.4? The answer is no. However, if the pH of the swimming pool finds a way to become acidic, then swimming pools can start dissolving your teeth. This usually occurs in gas-chlorinated pool systems. When swimming pools are gas-chlorinated, hypochlorous acid is formed. Normally swimming pools counteract this acid with a strong base, such as ash. If the swimming pool doesn’t get enough base to counter the acid from the chlorine, it can become acidic and start to dissolve the teeth of those who swim. For further reading on dental erosion and swimming pools, you can take a look at the CDC’s Morbidity and Mortality Weekly Report from July 22, 1983. One interesting statistic that they mention is that only 15% of frequent swimmers displayed enamel erosion while only 3% of infrequent or non-swimmers experienced enamel erosion. I assume that within the past 30 years, swimming pools are much more careful about testing the pH of their water to ensure that it is not too acidic, but it can still happen due to “inadequate maintenance” as the article above states. If you notice that you are getting stained teeth due to swimming, you may want to ask your dentist about coming in for more frequent cleanings. If you notice that you are losing some enamel on your teeth due to swimming, you may want to check with your swimming pool to make sure that their pH is within the normal range. Also, it may be a good idea to get frequent fluoride treatments from your dentist. Learn about the three ways fluoride protects your teeth. Are you a swimmer? Do you have any experiences to share or any questions/comments about this article? I’d love to hear what you have to say in the comments section below. Thanks for reading! Interesting. Thanks for doing this research. I swim a few times a week and am always interested in learning more about the potential harmful effects of chlorine. I came across this website as i googled the question whether pool chlorine can stain teeth. My son and nephew (both aged 5) have spent 6 weeks at grandparents in Spain. Swimming everyday for a few hours total. We just noticed that their front teeth have a brown stain like they are tea stained. It does appear to brush off. Hoping it hasn’t caused permanent damage. Off to the dentist when they get back to the UK!! Hi Clare – Thanks for sharing! They may have a mild case of “swimmer’s tooth” and that usually doesn’t pose any long-term damage. They have dentists in the UK??? thank you very much for creating this blog, its fabulous and very useful, btw i have major problem with my teeth, i am used to swim regularly, i already lost 2 teeth, the doctor said my teeth is very sensitive and get dissolve easily in Chlorine, he advice me to stop swimming, but its my life long hobby, i cant stop it, am very worried, coz even some of my teeth feeling dissolve, i changed many pools and talked to the pool supervisor to maintain the acidity, but still the same problem, plz advice if any solution for my problem…. Hi Salem – Properly maintained pools should not be dissolving your teeth. Do you know if there is anything else in your diet that could be causing your teeth to dissolve? Many fruit drinks and soda pop contain lots of acid. Thanx Dr.Tom, for your quick reply, actually the notification email from oral answer went to my spam folder, so just now i got your comment…… Usually am very careful when drinking soda, tea, coffe or any drink, i wash my mouth or brush after drinking, btw if u can advice some medicine or supplement to have stronger and healthier teeth in general, to avoid such problem in future…. I’m a swimmer and I swim over 16 hours a week. My teeth get really stained from the chlorine even though I brush them after meals and stuff. I’ve started going to the dentist once every 4 months and that helps a little bit. I’m a chiropractor and work with a number of swimmers. My own daughter is a swimmer averaging about 10 hours of pool time per week. She is getting the yellowing of the front teeth. What do I do about it? Is there something she should be taking, should we do more frequent cleanings, etc? There must be some way to counteract this. I am quite surprised – that as a chiropractor – you don’t claim to be able to cure this on your own. Everyone knows that in addition to be “back crackers” that you can also cure allergies, bunions, head aches and cancer. Please quit referring to yourself as “doctor” until you graduate from an accredited medical school. Wow, dude. Sorry you have come across some bad chiropractors in your days. Wondering if there’s anything new about fixing the yellowing teeth problem with swimming pools? My 2 year old son had the brown stains on his teeth as well. The dentist asked if he swam a lot, to which I replied yes. She got most of them off with her ultrasonic dental tool and told us to dry-brush his teeth right before swimming and also to use the top bristles of the toothbrush to brush the staining off. Great news? It worked! Staining is gone and I am a much happier mommy! That’s great Kim – Thanks for the tip! swimming. 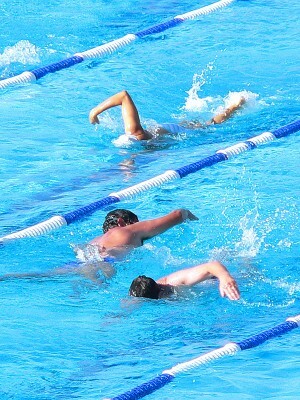 My son swims 6/7 days a week….they scraped off the brown stain and polished them! They look perfect!!!! Thanks for the information! Ive never had any problems with my Teeth. Just came across this discussion whilst doing a paper for Uni. 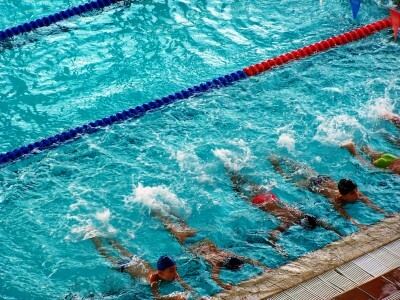 Ive been a a swimmer since I was about 2 years old (24 now). Sure I was pestered by my parents to brush my teeth, but Ive only ever had a filling once in my life – and that was a baby tooth. but well I still swim > 24hrs a week, and My coaches have always joked that I need to close my mouth when swimming because I’m creating drag, but I’ve just made that habit of leaving it open I guess. I put my good teeth down to 3 things – as a child I never really drunk water – every time I went to the fridge I was drinking milk (calcium) – we would go through 3Ls a day (dad and I), swimming in a chlorine pool (I have learnt that acids released in the mouth increase the acidity thus is why you toothpaste is a basic pH to neutralise this to prevent tooth decay) and well chlorine pools have seemed to add to this effect, and finally my parents keeping me in check for dental hygiene and good food choices. I have been swimming everyday for atleast one hour throughout the year since twelve years. Since One Week I have been experiencing a sensitivity in my teeth after swimming which is similar to the one when we eat excessive tamarind. Also I am experiencing little pain. I tried using SENSODENT RAPID RELIEF PASTE which gives me relief for that particular day and again experience the same feeling after swimming the next day. Probably, because of excessive chlorine levels in the water particularly in summer when huge rush will be there in the pools. I am regularly attending swimming classes of late I noticed sensitivity of my teeth after my sessions should I ask them to check the ph . Am worried about my daughter 4yrs old who is also learning swimming with me. How to prevent this pls help.. I swim at inside pool 3-5 times a week for an hour and have been for the last 6 years. My dentist used to say I had some strong, hard teeth…now the enamal is coming off all of them. I have calcium lines and even broke a piece of my tooth off by the gum. I kept thinking it was a vitamin thing, but could it be the pool? I swim two hours every day and I feel like I have yellower teeth with braces than what I should have. I brush my teeth twice a day, for two minutes each time and nothing seems to be working. Is there a way to protect my teeth from the chemicals in the chlorine? I do not drink tea, coffee, or pop. I only drink water. When j go to my check ups, the yellow does not seem to come off. I don’t know if it’s because my braces are in the way or what, suggestions?